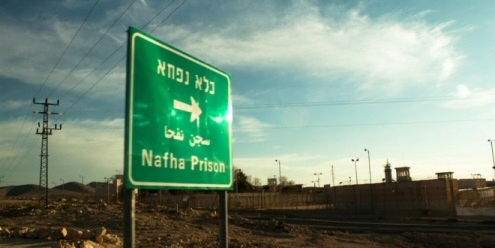 Palestinian Prisoners and Former Prisoners Committee, Thursday, said that 120 prisoners in Nafha prison –located in the occupied Naqab south of Israel, have announced an open hunger-strike in protest of the administration’s arbitrary transfer and ongoing repression policies.The 120 prisoners were forcibly transferred from section (10) in the prison, according to the PNN. And, they were not allowed to take any of their belongings with them, in light of last week’s state of disobedience, where the prisoners torched old cells in the prison, after the Dror and Mitsada forces brutally raided the rooms and attacked the prisoners. The prisoners also complained from the cruel treatment, since they are continually repressed by police dogs and teargas, in addition to the deteriorating health issues and food services. The administration has promised the prisoners that they would be moved back to their original cells, but did not commit, which escalated to the hunger-strike protest. Last week, the Prisoners’ Affairs Commission stated that prisoners in the Nafha have declared a state of rebellion and disobedience against the Prison Service and its repressive management. According to the Commission, the prisoners burned several rooms in the old sections of the prison, as a form of protest against the administration’s repressive actions towards them. Every day, the Israeli army launches arrest campaigns in Palestinian cities and villages under the alleged administrative detention policy. Briefly explained, this policy allows the Israeli government to detain Palestinians in Israeli jails with no trial or charge for up to six months, and this detention may be renewed an indefinite amount of times. Under administrative detention, prisoners are held without charge or trial and for an indefinite and renewable period of time. The use of administrative detention dates from the “emergency laws” of the British colonial era in Palestine. Israel uses administrative detention routinely as a form of collective punishment and mass detention of Palestinians, and frequently uses administrative detention when it fails to obtain confessions in interrogations of Palestinian detainees. Some 5,442 Palestinian security detainees and prisoners are currently held in Israeli prisons, 350 of them from the Gaza Strip, according to B’Tselem.